This fluoride-free, tooth powder is the most natural tooth product that remains both safe and effective. You could literally eat it. 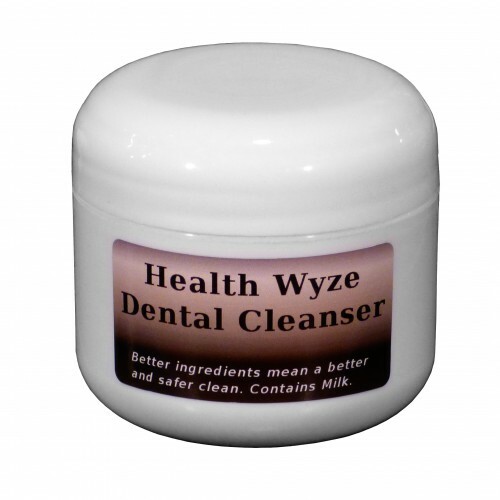 Our dental cleanser has all of the right minerals for tooth remineralization (tooth repair), and most products which claim to remineralize simply do not have the appropriate mineral combination, when they even have minerals at all. Our gentle formula is great for sensitive gums. Yet it extraordinarily cleans without solvents, soaps, and whilst not being abrasive. A pinch of zinc is added to give it a whitening property too. The cool, minty flavor is wonderful, with no burn whatsoever. It really will make you smile. It makes brushing enjoyable, and it is likely to remind you of the delicious toothpastes that you were given as a young child, even though you'll feel as if you've just visited a dentist. This product is almost certainly safer, tastier, and yet more powerful than whatever you currently use. It is absolutely unique. Powdered Milk -- This ingredient was chosen for its perfect blend of calcium and phosphorous in a concentrated form. It contains many other bioavailable nutrients for aiding teeth and bones. The most famous dentist and dental researcher of all time, Dr. Weston Price, discovered that dietary butter is the fastest way to remineralize (repair) the teeth. Butter is a type of nutritionally-concentrated milk, and so is powdered milk. Myrrh -- This is a completely safe and natural antibiotic that has cleaning properties without soap-like qualities. It makes the mouth feel good with a slight numbing tingle. It is likely to remind you of the professional dental cleansers and polishes to the degree that you will wonder if your dentist uses it. We suspect that it is one of the secret ingredients inside professional dental formulations. The myrrh that we use is of a superior quality than the type that is used inside of most myrrh products. We use only the light-beige myrrh, which can only be obtained through proper harvesting during the summer months. The more common and cheaper myrrh is cold-harvested, when the trees are unhealthy, and this improper harvesting results in a dark brown, weaker product, that tends to have a terrible taste and to be harmfully abrasive. We use the elite myrrh and pay dearly to obtain it. Magnesium Citrate -- This was chosen because the human body uses magnesium, calcium, and vitamin D together. Without magnesium, the calcium would be much less likely to bond with the teeth, or to be usable by the rest of the body. The "citrate" part comes from mixing the magnesium with citric acid, which is literally safe enough to eat. Citric acid is naturally found within some fruits. Zinc Gluconate -- This was chosen for its anti-bacterial and anti-yeast properties (i.e. anti-plague), along with the fact that zinc whitens teeth. The type of zinc that is being used in this product improves the flavor. The "gluconate" part comes from the addition of gluconic acid. It is a mild acid that occurs naturally in a variety of foods, including fruits and honey. Some researchers believe it to have nutritional value, but such research is in its infancy. Spearmint -- Our spearmint is truly natural. This is something that is rare in products. We do not use chemically-extracted spearmint compounds. Our spearmint is literally the powdered leaves of the spearmint plant with no alterations. Due to this, the spearmint used in our formulation releases chlorophyll. This is the extremely beneficial green pigment from plants. While F.D.A. regulations forbid us from making claims about how our product might benefit sufferers of gingivitis, chlorophyll was effectively used in yesteryear by major companies, such as Colgate, specifically to make toothpastes that cured gingivitis. The F.D.A. cannot stop us from reporting historical events. Peppermint -- Everything that was written above about spearmint applies to peppermint too. The type that we use is the real thing. It is not an extract. Just enough peppermint is added to our product, so there is no burning sensation from it. Competing commercial products tend to use enough "peppermint extract" to burn a person's mouth, because their chemical extract is used for masking the otherwise overwhelming taste of the other chemicals. The sensation that our natural peppermint causes is typically a cooling tingle. Your mouth will love you for it. We intentionally went light with this ingredient, because our older customers prefer a less spicy taste. Xylitol -- The xylitol that is used in this product is not genetically modified, is extracted from birch trees, and it is produced entirely in the United States. Therefore, our xylitol is typically of substantially higher quality than that which is found in retailers. As an artificial sweetener, this is the only unnatural ingredient of our formulation. We realize that the sellers and manufacturers of this ingredient typically label it as "all natural", but we have nevertheless decided to remain honest about it. Although, it could be feasibly argued that xylitol originates from natural sugars. It was extensively debated as to whether this ingredient should be chosen over the truly natural sweetener of stevia. We ultimately picked xylitol for the following reasons. Firstly, it is the absolute best of the artificial sweeteners, and it uniquely has a clean safety record with human use. Secondly, xylitol is extremely toxic to mouth plaque, without being toxic to the human body. Finally, xylitol is the only sweetener that is specifically known to strengthen tooth enamel, while most sweeteners weaken it. It is like topically-applied fluoride without any of fluoride's harmful effects. Thus, xylitol has a truly exceptional help-to-harm ratio for a dental product, such as ours. 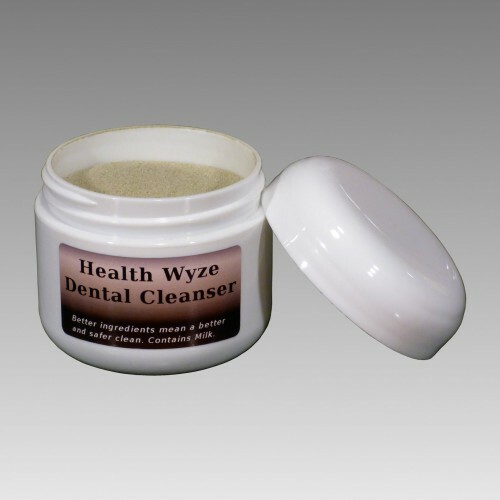 We have had significantly more requests to provide a better tooth cleanser than anything else at Health Wyze Media. We averaged a request every two weeks throughout an eight-year period. We understood why, when considering the other options. Every dental cleaner that we had examined was atrocious. Throughout the entire history of Health Wyze Media, we have been absolutely outraged by the sorry state of the consumer dental market, but we were unable to do anything about it throughout most of our history. By June of 2015, we had spent three years intensely studying the work of Dr. Weston Price, while doing our own independent research to seek something better, and more importantly, safer. We failed for three years. Not only were we unable to find an acceptable set of natural ingredients, but there was the greater problem of bacteria, which would poisonously contaminate any truly natural toothpaste, since all toothpastes are liquefied. This fact should give readers a reason to pause and consider that every existing toothpaste must be made toxic for the sake of neutralizing bacteria. It means that all of the "natural" toothpastes are a lie, for it is not possible to make a truly natural toothpaste that is safe from bacterial colonies. There are no exceptions. In the early part of June in 2015, we found ourselves feeling beaten. Three years of searching for something better had yielded nothing. There were the problems with moisture and bacteria, combined with an inability to provide the right minerals in a safe and organic way. Even the use of baking soda was not an option; due to its lack of benefits, and its abrasive qualities. In our depressed stupor, we stared at the many pages of data before us, and we finally asked our boss for help. Some of you know of him as God. Within a couple of hours, we recalled some things of great significance that had long been forgotten. We remembered the world's first and most natural antibiotic: myrrh resin. It was the favorite medicine of Hippocrates, who is known as the Father of Medicine. It was also one of the treasures that was given to the newborn Jesus by visiting wise men. This completely natural ingredient can clean and somewhat sterilize the mouth, and then keep it feeling fresh for about a day afterward. However, this was not the end of our epiphany. We next realized that we would not need to obtain our main ingredient for tooth remineralization from the chemical industry, as we had feared. Namely, it was monocalcium phosphate that we had been seeking. We could get a much better mineral composition and a more natural ratio by using powdered milk instead, which is what the human body already uses to build bones and teeth. We borrowed from God's engineering to get our mineral ratio perfect. It is something that cannot be surpassed for tooth health, no matter how many billions are poured into dental research. Our final epiphany was that we should not make a toothpaste at all, but instead create an old-fashioned tooth powder. This would make the minerals more concentrated, and keep the product sterile. Keeping it dehydrated eliminates bacteria and the subsequent need to create a toxic product. Most health-conscious people already know about the horrendous problems with fluoride toothpastes, such as the fluoride-induced cancers, infertility, and even fluoride-induced cavities. One great irony is how communities suddenly get huge spikes in the number of cavities whenever water fluoridation is implemented, which means that officials have been dishonest for decades about why fluoride is contaminating the water supplies of most American communities. The so-called "natural" tooth products are nearly as bad as the fluoridated products are, and health-conscious people usually have no idea just how bad they are. Our biggest competition in the better and more natural toothpaste category are the offerings from Tom's of Maine. Inside most of their 'natural' toothpastes is sodium laurel sulfate. Where does this organic ingredient grow? It comes from a factory where ethylene oxide and sulfuric acid are combined. This 'natural' ingredient is used as an industrial degreaser, and it is carcinogenic. When it breaks down, it releases another poison: 1,4-dioxane. It has been repeatedly shown to cause cancers in animal studies. 1,4-dioxane is also known for causing kidney, liver, and nervous system damage. Likewise the titanium dioxide that is also included in their 'natural' products causes cancers too. Other members of the company's allegedly 'natural' toothpaste family contain sodium cocoyl glutamate as a foaming agent. This chemical is made mostly of glutamic acid, which is the active neurotoxic (excitotoxin) compound within monosodium glutamate (MSG). Glutamate compounds are sometimes used as insecticides. Sodium cocoyl glutamate is essentially a variant of MSG that allows companies to hide it in plain sight with disingenuous labeling. It is truly disgraceful that so many people, who are paying extra for "safe" toothpastes, are actually getting something that permanently lowers their intelligence and puts them at a significantly greater risk of sudden-onset heart attacks, by neutralizing the taurine and magnesium reserves, which regulate pulse. This free form of chemically-extracted glutamic acid is about as 'natural' as high fructose corn syrup is, and the putrid yeast that is used to free the glutamic acid is genetically engineered. It is much like brushing the teeth with Doritos, and more concentrated glutamate reaches the blood through this direct-mouth absorption than would be gotten by eating it, since transdermal absorption into the blood bypasses the safety mechanisms of digestion. We could seemingly continue endlessly about such despicable ingredients, and the dishonesty from the companies which produce 'natural' toothpastes. We are astonished that nobody has yet instituted a class-action lawsuit regarding such 'natural' products. This sort of behavior is simply business-as-usual within the dental industry, and Tom's is hardly the worst offender. Even the supposedly good ingredients in the other natural toothpastes tend to be booby traps. Take for instance the inclusion of citrus ingredients, such as vitamin C (e.g. ascorbic acid or sodium ascorbate). These ingredients make for excellent marketing, but at the customers' expense; since everybody knows that "vitamin C is healthy". What everybody does not know is that such acidic ingredients weaken the tooth enamel upon topical applications, and that such ingredients actually demineralize the teeth over time. Thus, the high concentrations of vitamin C in many of the soft drink brands -- to make those drinks healthy -- is ironically one of the main reasons why soft drinks are so damaging to dental health. We're betting that you thought it was merely the sugar. The bottom line here, is that if you are going to be buying products that will play a significant role in your long-term health, then it would be very wise to buy such products from Christians. Earth Paste is well suited to be a big competitor of our product, because it is significantly more natural than the other competing products. As with all of the others; we nevertheless consider it to be wholly unacceptable. Earth Paste has clay as its main ingredient: literally a type of mud. This might seem safe and natural enough for some people, but after years of usage, the sanding of the teeth will take an irreparable toll upon the enamel. Another misgiving is how the mineral constituents of such products do not match what is ideal for dental health in any way. The randomized mineral composition of clay is simply not going to be productive, and there is also an elevated risk of contaminants, since it is dug from river beds. The potential contaminants include dioxins, PCB's, heavy metals, human sewage, and hundreds of toxic chemicals. To summarize, we feel that it is patently foolish to brush with river muck. If possible, get some pure or spring water for dampening the toothbrush and for rinsing after finishing. Chlorine and fluoride will somewhat neutralize the beneficial effects of this product. Dampen the toothbrush, but shake out the excess water. The brush should be damp but not wet. Gently tap the bristles of the toothbrush against the powdered cleanser, so that some of the product attaches to the brush. Brush the teeth as is normal. Avoid getting water droplets inside the powder and keep the container closed between brushings. Be careful not to overtighten when closing the container. If the dental powder gets onto the threads of the cap, and it is sealed tightly, then the container might be difficult to reopen. If this problem is experienced, then peck the top of the container with a toothbrush handle to vibrate the cap, before reattempting to open the container. Xylitol is dangerous to dogs. Therefore, this product should never be used to clean a dog's teeth. The issue is largely that Xylitol is so much like real sugar to a dog that his body will release massive amounts of insulin to counteract this "sugar", when there really is no sugar at all. The excessive insulin causes a massive drop in the dog's real blood sugar, which can be life-threatening. The best solution is to counteract the insulin by giving the dog some real sugar. It can simply be a spoonful of table sugar, or even candy. Avoid chocolate, unless it is the only option. This is the quickest and safest fix for a dog that is suffering from Xylitol toxicity. Taking the dog to the veterinarian will simply cost precious time. What can I expect overall? 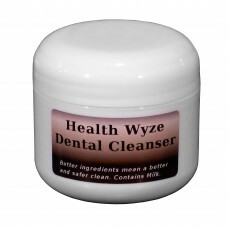 The Health Wyze Dental Cleanser has a taste that is very much like that of chewing gum. It feels different, especially for people who have never used a tooth powder before, and the feeling is difficult to describe. The feeling afterward is a combination of a slight numbness with a minty tingle, which can last for hours. We feel as if we have just visited the dentist after having brushed, which is largely caused by the myrrh. The most surprising thing will be the appearance of the spit. As mentioned earlier, the spearmint will release chlorophyll to give the spit a very green appearance. Little kids will love that, but it can be startling to adults during their first brushing. The tooth powder itself already has a greenish tint, but the green color is amplified during brushing; due to wetness and the release of chlorophyll. Every individual is different, so we cannot make promises concerning results, but we believe that most people will get better results from this product than whatever else they have used before. How long will a container last me and my family? We cannot be absolutely certain, because people use differing amounts. The makers of other tooth powders claim that a two-ounce container, such as ours, provides enough product for about 200 brushings. A single container lasts about a month for our four-person family. Spearmint particles have a tendency to mat together at the base of a toothbrush's bristles, and these specks can be observed in a toothbrush that is made from clear plastic. The specks are removable with a toothpick or a needle. It is possible that the chlorophyll may stain clothing or other items. Therefore, immediately rinse spillage on clothing and furniture with water to eliminate the staining risk. The product will not stain the teeth green, and it is as safe as eating vegetables in this regard. Dr. Weston Price discovered that most of the things that are taught about dental health are lies. Foremost of these lies is that dental cavities are permanent injuries that require aggressive and invasive interventions with unnatural materials. Early dental cavities will often heal (remineralize) if they are provided with the right nutrition, just like every other kind of injury. It is bad nutrition that causes cavities by stimulating pathogens and a state of acidosis. Our product is intended to act as a mouth supplement in aiding the natural remineralization process, as well as to promote general cleanliness and health. Virtually every other "remineralization" product on the market is a fraud, and most actually hinder the remineralization process. All standard toothpastes do. My child ate this product, so what should I do? If a child merely swallowed the amount that is normally used for brushing, then he would be fine. It would be as if he had taken a strong mineral supplement, alongside an all-natural antibiotic. If he ate half of a container or more, then keep him near the bathroom. The large amount of zinc would likely cause stomach pain, with a high probability of profuse vomiting. If the child somehow retains a large amount of it without vomiting, then he would be likely to experience diarrhea and cramping for a day, because of the high concentration of magnesium. Therefore, eating the product like candy is a mistake that he would make only once. However, there would be no need to get help. Why are there some hard clumps in the powder? Hard clumps indicate that someone has allowed water droplets to fall into the powder. Mini teeth were essentially created like making cement. It means that the powder worked as it was supposed to, so there is no need for concern. It is usually best to gently fish such chunks out. Water droplets will usually bead on the surface for a short period, so they should be immediately removed using the wicking action of a quality paper towel, in order to prevent clumps from forming.